noncommutative geometry : a medieval science? According to a science article in the New York Times, archeologists have discovered “signs of advanced math” in medieval mosaics. 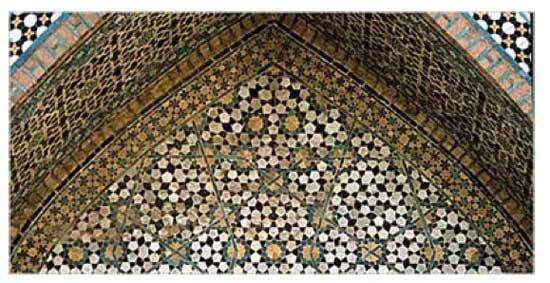 An example of a quasi-crystalline Penrose pattern was found at the Darb-i Imam shrine in Isfahan, Iran. 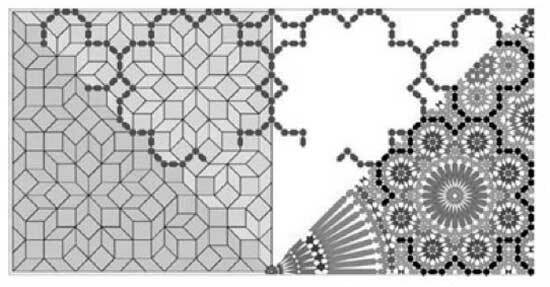 Penrose tilings are one of the motivating examples of Alain Connes’ book as there is a $C^* $-algebra associated to it. In fact, the algebra is AF ( a limit of semi-simple finite dimensional algebras) so is even a formally smooth algebra in Kontsevichian noncommutative geometry (it is remarkable how quickly one gets used to silly terminology…). However, the Penrose algebra is simple, so rather useless from the point of view of finite dimensional representations… Still, Connesian noncommutative geometry may be a recent incarnation of the medieval Tehran program (pun intended). Thanks to easwaran for the link (via Technorati). Added, March 1 : I haven’t looked at the Connes-Marcolli paper A walk in the noncommutative garden for a while but now that I do, I see that they mentioned the above already at the end of their section on Tilings (page 32). They also include clearer pictures.